FDG has prepared the design and draft construction documents for pedestrian connectivity targeted towards high school students walking to and from school. This work adheres to ADA design standards and includes sidewalk improvements, a multi-use path thru a City Park, a half-street widening and street stormwater planter box improvements. Conducted site topographic and right-of-way survey along 5000 lineal feet of “B” street and prepared base maps for design. Developed design for new sidewalks, ADA ramps and bicycle lanes along the length of the south side of “B” street. 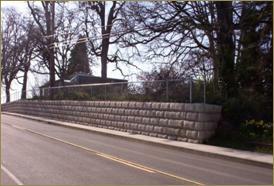 Project required geo-technical investigation along hillside for retaining wall design and fill sections. The design incorporated several pedestrian safety elements including curb bulb outs, solar powered flashing stop signs, elevated pedestrian crossing with surface mounted warning lights, pedestrian refuges and rapid flashing beacons mounted on the pedestrian crossing warning signs. FDG prepared the design for a full width street improvement including coring out existing road base, new base with new asphalt, new curb and sidewalks on both sides of the street, replaced culvert crossing with uniquely specified high flow pipe, and constructed new waterline to replace asbestos cement pipe. The design will incorporate vegetated planter boxes to allow for stormwater treatment prior to discharging into Cemetery Creek. Project entailed designing a 600 lineal foot collector road extension to service a new high school. The design included collecting and managing a pre-existing stormwater discharge thru the project site and developing a detention and treatment system for the new road improvements. The design included full right-of-way improvement with a center median and sidewalks/planter strips on both sides of the road extension. Design of approximately 1,425 lineal feet of curb and sidewalk improvements, including a retaining wall and storm drainage improvements, for the City of Silverton. 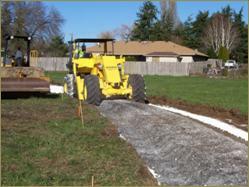 Work included preparation of a construction easement, coordination with ODOT as street is a state highway, right-of-way acquisition and preparation of bid documents and specifications. This project was located along a primary route for school children and the desire was to add sidewalks to increased pedestrian safety. FDG conducted public outreach with the local business’ and residents, prepared construction plans and bid documents for 450 lineal feet of street and sidewalk improvements along West Main Street. 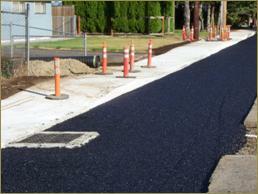 Project entailed commercial driveways, 8ft sidewalks, storm sewer and curb. Unique to the project was integrating a new sidewalk with the existing parking to allow for ADA 4ft. clearance with the overhang of a parked vehicle. Additionally this project was grant funded and FDG was required to prepare a design that adhered to the funding requirements. Provided survey, design and permitting services for multi-use pedestrian path improvements within the Mill Creek Greenway corridor. Project required a complete topographical survey of City park properties that are located in a contiguous serious for approximately a mile in length. The design required two trail head parking improvements and consideration of creek crossings, wetland impacts, no-rise flood plain analysis and pedestrian safety at four major road crossings. Additionally, a public parking lot, trailhead signage, viewing platforms and benches were trail amenities integrated into the design. Provided the site topographical and right-of-way survey and developed the project base maps. Prepared the construction plans for curb tight sidewalk improvements along 800 lineal feet of 3rd Street including extending the asphalt pavement to the new curb and modifying the storm collection conveyance system. Project entailed one major pedestrian crossing that utilized a stamped concrete pattern for the crosswalk. This project was unique in that the City used this opportunity to utilize pervious asphalt for the new pavement sections as a test site for future use within the City. Prepared preliminary design, construction plans and bid documents for two separate 600 lineal feet street and sidewalk improvements. Improvements included sidewalk, curb, gutter, retaining walls, infiltration rain gardens, new subgrade rock base and asphalt. This project dealt with incorporating the unique features of the existing residential lots including mature trees, matching driveways, retaining walls, and encroachment issues. Public outreach was a key component to this project as the improvements altered the use of the street as the neighbors were accustomed to.